Sunday April 2nd 1893 I was busy about the work all forenoon. Josie went to church. The folks went to church and then over the river for dinner. Will and I went to Woolfs and stopped at home a little while. we spent the evening at home and the folks went to church. I felt very tired. This has been Easter Sunday. Willie went back to Chicago. 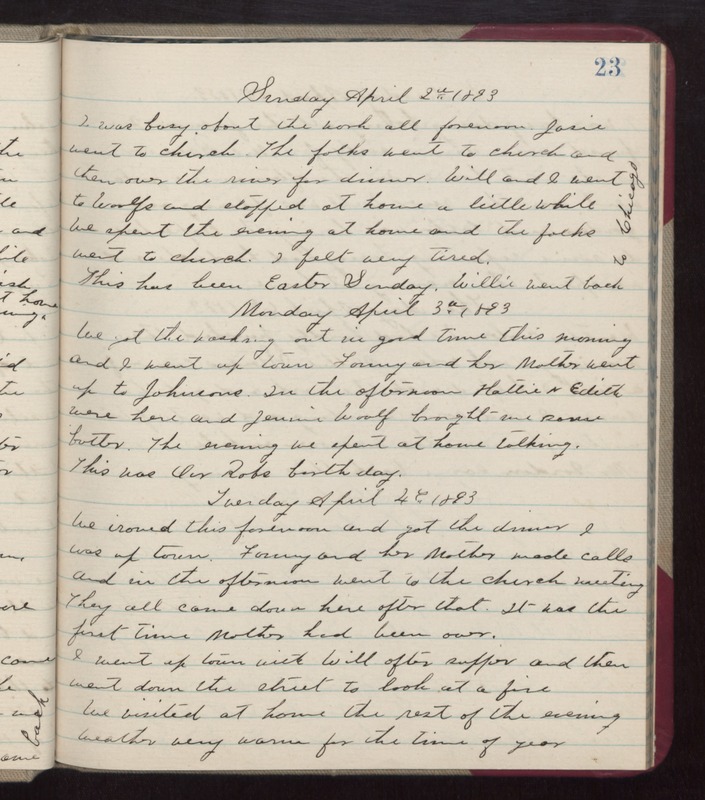 Monday April 3rd 1893 We got the washing out in good time this morning and I went up town. Fanny and her Mother went up to Johnsons. In the afternoon Hattie & Edith were here and Jennie Woolf brought me some butter. The evening spent at home talking. This was Our Robs birthday. Tuesday April 4th 1893 We ironed this forenoon and got the dinner. I was up town. Fanny and her Mother made calls and in the afternoon went to the church meeting. They all came down here after that. It was the first time Mother had been over. I went up town with Will after supper and then went down the street to look at a fire. We visited at home the rest of the evening. weather very warm for the time of year.